Major Hazard Installation Regulations have been in South African legislation since 2001 and still today many employers, their safety and risk managers have limited or incorrect knowledge in what is an Major Hazardous Installation(MHI) . The Occupational Health and Safety Act defines a Major Hazard Installation as (a) where more than the prescribed quantity of a substance is kept or maybe kept (The listed substances are provided in General Machinery Regulations Schedule A) and (b) where the substance is processed, produced, used ,handled or stored which has the potential to cause a major incident. Depending on the type (area) of risk, the second and third steps may be described slightly differently (for example in a chemical exposure QRA, the steps are called toxicity assessment and exposure assessment), but they still deal with consequence and frequency of occurrence. 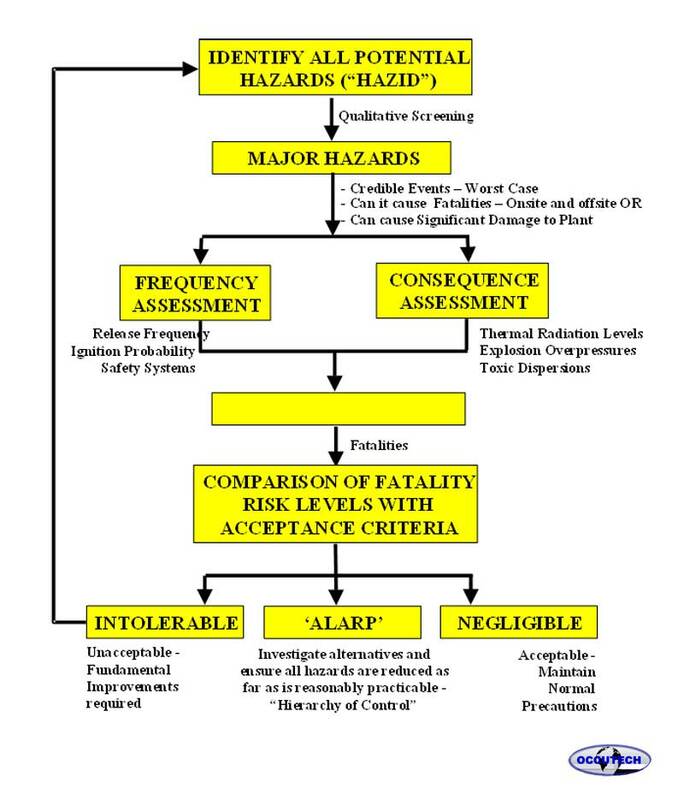 Hazard identification always comes first and risk characterisation always occurs last in the process, but consequence and frequency are typically evaluated simultaneously. A graphical representation of the QRA process is presented in the following figure. A large number of methods are available and are used. A description of the details how the report was compiled and a description of the methodology used for the analysis is important. Proposed new legislation and SANS Code of Practice on the Risk Assessment in South Africa will provide clearer guidance .Where changes have been made to the approach to Hazard Identification, Consequence Assessment, Failure Frequency and Probability Estimation, and Risk Analysis taken must be specified. Sources of data should be clearly identified so that the analysis is reproducible from the base data if necessary. All assumptions, including operating philosophy and any modelling simplifications should be thoroughly discussed. This is a critical aspect of the MHI Risk Assessment. All chemicals, processes and activities should be identified and their potential controls and potential risk determined. Sometimes risk assessors ignore simple issues which could present a significant risk. For example dust on floors and around equipment or on rafters. This dust could be flammable and explosive .This section should present the hazards that were identified as a part of the process and the means by which the task was completed (HAZID, HAZOP, etc.). The personnel that participated in hazard identification should be noted. In South African terms this must be the SANAS accredited MHI Risk Assessor. For a risk to occur a loss of containment or control has to occur. MHI require the actual or potential failure rate to be determined or calculated. Currently there are many sources of the data. These include UK HSE failure rates, Bevi and many others. New SA legislation will provide guidance. The risk assessor should provide details of the source(s) and also explain the logic behind different failure mechanisms, details of the logic behind the event trees and fault trees analyses if used, etc. The primary purpose of the MHI Risk Assessment is to characterised the risk. This section should provide the specific risk statistics that have been derived to present, rank and evaluate the hazards that were evaluated. It should also summarise what options have been evaluated and the criteria by which the statistics will be ranked. The characterisation of risk is the main purpose of the report, so the reader should be taken back to the original objectives and indicate how they have been fulfilled. All risk assessments including MHI Risk Assessments must have recommendations. If recommendations are made, they should be confined strictly to the scope of the work. Additional findings and recommendations that are arrived at during the course of the exercise should be addressed separately from the MHI Risk Assessment Report. Provide a list of all references used for the MHI Risk Assessment so that results and conclusions are fully traceable and auditable. SA MHI legislation requires Appendices. This includes Department of Labour Accreditation Certificate, SANAS accreditation and an Executive Report Summary and other Appendices. These other Appendices should contain relevant information or data that might make the report easier to understand In some instances it can contained detailed information which may not be for all readers and is not appropriate in the main body of the report. SA legislation also requires the site Emergency plan to be provide and to be evaluated by the Risk Assessor. All HI Risk Assessment Reports will be read by a wide variety of persons .It can be beneficial to place the detailed technical analysis for outflow modelling, frequency assessment, consequence modelling and fatality assessment in the Appendices, such that the main body of the report remains readable from a non-technical reader.